If you’ve been paying attention for the past decade or so you’ve likely noticed that it’s easier than ever to build a website for your business. With website builders like Wix, Squarespace, and WordPress simplifying the website building process, many businesses might be wondering why they should bother with custom web design in the first place. With that being said, both custom web design and website templates have their pros and cons and tend to be suited for specific audiences. True custom web design involves building a website from scratch using code. There are no templates involved, no pre-packaged graphics or anything of the sort. Many people falsely believe that fully customizable website templates count as custom web design. Website templates only allow you to personalize web pages within predefined boundaries. Custom web design, on the other hand, allows you to control every aspect of the design process. It takes a significant skill set to create a fully customized website. If your business doesn’t have an in-house web developer, you’ll likely reach out to a digital marketing agency to create a custom website for you. Web development website templates may be easy to use, but they’re very rigid when it comes to true customization. Let’s look at the advantages custom web design can offer for your business. One of the main advantages of custom web design is your ability to create unique websites. Essentially, you can make your site look like anything you want, and you won’t have to deal with the limitations of working with a premade template. In fact, you can go as far as to make a custom template that’s unique to your business. That’s the beauty of using custom web design – you have complete control. Learning how to find a good web design company will give you access to a team of professional developers who can help you troubleshoot problems and get you your site up and running with minimal turnaround. Troubleshooting services aren’t always necessarily free, but professional-grade quality rarely is. With the price tag however, comes the peace of mind that if anything ever goes wrong with your custom website, you can call up your web developer and have them fix it for you. This is opposed to website templates where most of the troubleshooting either falls upon yourself or someone in your staff who’s website savvy. A website template may or may not be updated depending on how active the developer team is. However, a top-of-the-line agency that offers custom web design services in Houston will always be on top of keeping their code up to date. Additionally, they’ll always be watching for changes to the Google algorithm and update your website accordingly to help you stay ahead of the curve. Building your website from the ground up means you can continue adding to your site as often as you like. In fact, there’s nothing to stop you from contacting your web developer and having them add new features every month. On top of being scalable, a custom website may also make managing your business much easier. For example, you can tweak the way you collect email addresses for marketing when visitors land on your site. Website templates only allow you to manage your website to a limited degree. With custom web design the possibilities of customization are only limited by the skill of your web developer. Website templates are premade web pages that can be easily customized with videos, blogs, images and more. There are literally thousands of website templates you can purchase online that offer all manner of designs and styles. Most website templates are easy to install though some are easier to work with then others. With so many website templates floating around online, the quality of the template may vary and so can the level of support you receive from the development team. Website templates are perfect for smaller businesses or personal use. There are several perks of using digital website templates that can benefit your business’s marketing ROI, speed-to-market, and hiring efforts. This may not be much of an issue for larger, well-established businesses, but startups, smaller scale businesses and solopreneurs are often pinching pennies just to make ends meet. Website templates are cheap, many of which can be purchased for as low as $45. High-end templates are relatively affordable. With providers like Blue Host offering affordable pricing to host your website, it’s no wonder so many people rely upon website templates to build their sites. If you know what you’re doing, you can throw together a decent templated website in an hour or less. You don’t have to worry about working with code or any of the other tedious aspects of creating a customized website. Essentially the hard part has been taken care of for you. You can simply drag and drop until you’re satisfied. To piggyback off the previous point, just about anyone can build a website nowadays with a good website template. Some templates require a learning curve, but many are drag and drop meaning it doesn’t take much brain power to throw together a decent website. Check out our list of website must-haves for your upcoming redesign. Do Web Designers Use Templates? Custom web design and website templates are not always mutually exclusive. It is entirely possible for a graphic design agency to create a visually appealing and engaging state of the art website design that a web developer then transposes into a scalable template. This process depends on the needs of your internal team. If content marketing is a small business marketing strategy that works for your internal team, then templates are very important. For consistently styled content that doesn’t require custom code every time you want to add a web page, your web designs need to be applied to templates. Check out MARION’s WordPress web design in Houston for scalable website designs that your marketing team can manage. Custom Website Design vs. Website Templates – Which Is Right for You? As you can see, there’s no one right choice for every situation. Every business is different, so you need to focus on your specific needs. 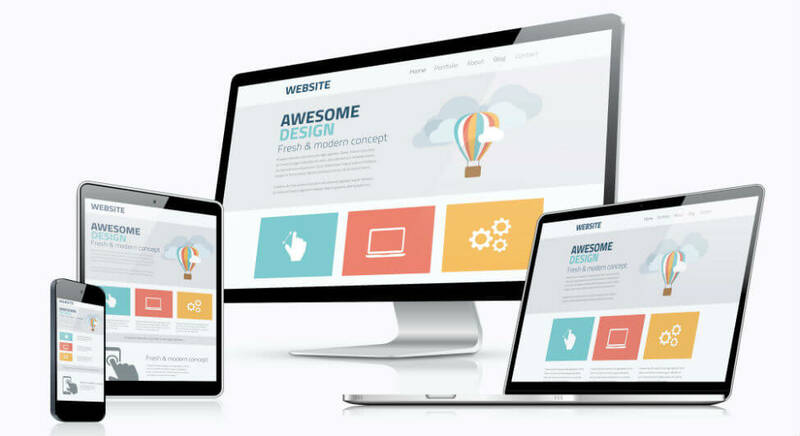 If you’re a startup with a tight budget and you don’t have the time or expertise to methodically put together a complicated custom website, then digital website templates are likely the best option for you. On the other hand, if you’re searching for a website that’s fully customizable, unique, built to code and gives you complete control, then you’ll be better off with a custom website. Ultimately, the needs of your business as well as your personal preference will play a huge role in which option you choose. As stated before, website templates tend to be the domain of smaller businesses with tight budgets, whereas customized websites tend to be the preferred choice for larger well-established businesses. If you’re interested in building a custom website for your business MARION can help. Our team of award-winning web developers will be able to create the ultimate website that captures the essence of your brand. Our web design services are top-notch and we’re here to help you. If you want to work with a highly rated team contact us today.